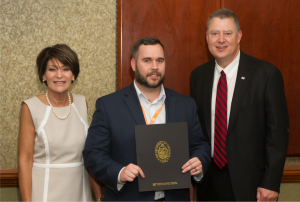 Jonathon Connell was one of more than 50 economic development professionals from Tennessee and 10 other states who graduated from the 12th annual Tennessee Basic Economic Development Course (TBEDC) in May in Nashville. Connell is a development specialist with the Southeast Tennessee Development District. The week-long course is one of 10 courses offered by the UT Center for Industrial Services (UT CIS), an agency of the University of Tennessee Institute for Public Service (IPS), and is considered the cornerstone of the Tennessee Certified Economic Developer (TCED) professional certification program. The course also is accredited by the International Economic Development Council. Attendees learned best practices in economic and community development, new methods and programs to promote job growth and investment, and discussed emerging trends and factors that shape local and regional economies. This year’s diverse class had a range of participants that included chamber of commerce and economic and community development organization professionals, elected and appointed officials, state government agency staff, community planners and business leaders. “The interest, engagement and knowledge of the participants made this truly a unique experience,” said Kim Denton, TBEDC course director and TCED director. Over the course of the week, the class heard presentations from more than 25 expert practitioners in many disciplines of economic development. Participants said one of the biggest benefits of the experience, beyond the presentations, was the relationships built over the week. Case studies, group work, class discussions and after-class activities gave everyone the opportunity to create a broad network across Tennessee. “We were so fortunate to have top-notch, nationally recognized Tennessee economic development professionals as instructors at the TBEDC,” Denton said. The week closed with the TBEDC graduation ceremony. IPS Vice President Dr. Herb Byrd and Denton presented the completion certificates. For more information about economic development training opportunities, please contact Kim Denton, CEcD at kim.denton@tennessee.edu or (865) 974-8464.